1. The act of putting off, delaying, or deferring an action to a later time: "Procrastination involves a situation requiring a task that may be perceived as overwhelming, difficult, tedious, or boring." "For some people, procrastinations are unenjoyable and therefore, stressful." 2. The consequence of not getting around to doing something: "Procrastination is said to take place because a person is disorganized or not very dutiful (careful to fulfill obligations), and is probably an uncontrollable psychological condition." "Procrastination or task aversion is an irrational delay of an intended course of action, even while expecting a situation to be worse off for the delay." "Procrastination is usually caused by the association of pain or discomfort with the prospective course of action; that is, some form of stress. This may be physical; such as, that experienced during hard labor or vigorous exercise, or psychological; such as, a form of frustration or anxiety." 3. Etymology: from Latin procrastinatus: pro-, "forward" and crastinus, "tomorrow". The result of not getting something completed: "Gerold was accused of being a procrastinative worker when he was given certain assignments." A description of delaying the completion of something until a future time: "Susanne's procrastinatively habitually slowness in providing information for clients resulted in her losing her job." The postponement of the completion of some action until a future time; if at all: "Jesse was asked to come up with a series of synonyms for the term procrastinativeness and his list of verbal forms includes the following: prolong, put off, suspend, put aside, put on ice, put in cold storage, put on a back burner, hold in abeyance, vacillate, hesitate, dillydally, and neglect." Someone who puts off doing something until some other time (if at all); a delayer, a postponer, a malingerer, a shirker, and an evader: As a procrastinator, Mike deviates from the task, usually in favor of doing another more enjoyable activity. A procrastinator is a person who puts off until tomorrow the things that he or she has already put off until today. 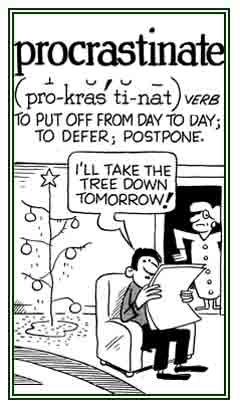 Although the following cartoon refers to a verb, it helps to illustrate the meaning of this noun entry. A reference to dawdling, deferring, suspending, protracting, or prolonging an action: "Rosetta's procrastinatory habits made it extremely difficult for her to find a job." 1. Generating; producing; productive; fruitful; assisting in procreation. 2. Someone who, or that which, procreates. 1. To produce offspring (children) by reproduction. 2. To beget and to conceive (offspring). 3. To produce or to create; to originate. 4. To create or to produce something. Offspring, or children, who have been produced. 1. The conception and bearing of offspring or children. 2. The act of begetting children. 3. The generation and production of offspring. 4. The entire process of bringing a new individual, or individuals, into the world. 1. Producing new life or offspring. 2. Capable of reproducing; generative. 3. Having the ability to beget or procreate. Having the ability to bring a new individual, or individuals, into the world. Someone who begets or generates children; such as, a father. 1. Lying down with the face to the ground: On sunny afternoons, the dog was often in a procumbent situation under a shady tree. 2. Prone; lying face downward: Josh slipped on the ice and wound up in a procumbent position in a snow bank. 3. A reference to a plant stem that grows along the ground without taking root: The gardener was careful when cutting the grass to avoid trimming the procumbent trailers of the berry plants. 4. Etymology: from Latin procumbent-, present participle of procumbere "to fall forward"; from cumbere, "to lie down".